The Glory Bus was first published by Hodder Headline in April 2005. That was four years after Laymon’s death. A few months later, in September, the book was reprinted by Leisure Books, under the title Into the Fire. The central character is a young lady called Pamela. Overnight she has gone from being a happy newlywed to being a widow and it’s all because of a rather strange individual named Rodney. He has been lusting after Pamela since high school and now he has finally got what he has always wanted. Of course, it was necessary for him to kill Pamela’s husband first, and then tie her up and kidnap her, but he’s still got what he wanted. Rodney has a house in the middle of the desert and that’s where he intends to take Pamela. Before he reaches home, she persuades him to stop the car for her to relieve her bladder. Rodney doesn’t want to stop, but the chance of watching her do her business is too much for him, so he stops. Norman is the next character to be introduced. Maybe things would have been different if he’d locked his car door before he went to pay for the fuel. Then again, perhaps he shouldn’t have wasted time going back for jerky. Either way, when Norman returns to the car he finds Duke sitting in the passenger seat and refusing to be moved. Norman is the kind of guy who gets tears in his eyes and Duke is the kind of guy that gives people tears in their eyes. He is a hard man. Argument is out of the question. They head off down the road together. Boots isn’t likely to win any beauty contests, but she has a certain slutty charm and, on Duke’s insistence, Norman stops and picks her up. So far, it’s as if Norman has been hijacked and he intends to dump the pair as soon as possible. When his chance finally comes he lets it slip through his fingers because, by then, he has developed a lusty interest in Boots. Both his companions are trouble, so pretty soon Norman is in trouble, and he and the gruesome twosome are heading out into the desert to escape the police. The glory bus travels the dusty plains picking up those who are in trouble. No ticket is required, but don’t talk to the driver when the bus in motion. Pamela takes a trip on the bus after her escape from Rodney. Later on, so do Norman, Duke, and Boots. There are some very engaging and unique Characters in The Glory Bus and, in true Laymon style, some of the characters have nasty personality flaws. I found Norman particularly interesting. He changes quite a bit as the story progresses and by the final pages I was wondering how much of what Norman did could be put down to the company he was keeping and how much was the real him emerging. The Glory Bus is about 442 pages. It moves at a pretty decent pace and provides plenty of reasons to keep the pages turning. The average chapter contains eight pages, so it never really becomes necessary to put the book down in the middle of one. 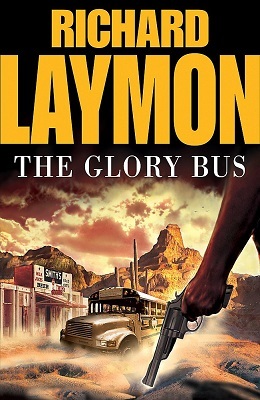 It’s an interesting book that should appeal to a wide variety of readers but, as with much of Laymon’s work, The Glory Bus contains sexual elements and scenes of gore that some people may find offensive.